The cable television miniseries about the 1995 O.J. Simpson double-murder trial has proven surprisingly popular, so much so that there’s been a good deal of interest in determining how closely the dramatization hews to the factual record. The episodes of the 10-part miniseries, which air Tuesday nights on FX, are hardly a documentary treatment about what in 1995 was often called the “Trial of the Century.” They are, though, a rough approximation of what went on — notwithstanding some utterly made-up scenes, such as a prosecutor’s dramatic collapse in the courtroom. The miniseries, called The People v. O.J. Simpson, mirrors the trial in another, glaring respect: The victims have been largely overlooked, obscured, or effectively treated as incidental. The violent slashing deaths in west Los Angeles in June 1994 of Nicole Brown Simpson and Ronald L. Goldman were the reasons Simpson, a black former professional football player and celebrity, stood trial in 1995. Their deaths were the moral center of the case against him. The trial began in late January 1995 and as it wore on, the vicious killings of Nicole Simpson and Ron Goldman receded amid a welter of legal maneuvering, prosecutorial missteps, dubious conspiracy theories, the injection of race and questions about the use of racial slurs. The sideshows became the trial’s main show, and the news media found it all irresistible. In early October 1995, Simpson was acquitted by a jury that had spent fewer than four hours reviewing the evidence. So it is with the FX miniseries. The episodes reveal the producers’ fascination with sideshow — especially with high-powered personalities such as the character of Johnnie L. Cochran Jr., Simpson’s lead defense lawyer, and with flawed Los Angeles police detectives such as Mark Fuhrman, who during the trial was revealed as a racist. Through the first seven episodes, the miniseries has focused on the likes of Cochran and Fuhrman and lead prosecutor Marcia Clark, while offering only occasional, glancing reminders of the murder victims and the crimes that brought Simpson to trial. Complaints about the misguided focus have been few, and faint. Goldman’s father, Fred, and sister, Kim, have notably challenged the program’s emphases and its indifferent regard of the victims. One of the most perceptive chroniclers of the 1995 trial was Dominick Dunne, a correspondent for Vanity Fair. 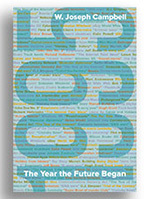 He likened the proceedings to “a great trash novel come to life,” a telling characterization that I quoted in my latest book, 1995: The Year the Future Began. Dunne’s 2001 book, Justice: Crime, Trials, and Punishments, included several chapters about the Simpson trial that were repurposed from his Vanity Fair articles. Dunne was no apologist for Simpson and was quite certain of his guilt. This entry was posted on March 21, 2016 by W. Joseph Campbell in Popular culture, Scandal, Simpson trial and tagged 'Trial of the century', 1995, Crime, O.J. Simpson, Recent past, scandal.